Are mobile games with an 'action mouth' icon more successful? Is there a simple secret to app store success? Probably not, but that doesn't mean there aren't dozen of little tweaks you can perform to improve your chances of success. One company that spends a lot of time considering this is Israeli app marketing platform IronSource. Driving over 6 million apps and PC installs every day for its clients, it has a lot of data available to crunch and mine for interesting angles. And with IronLabs, its own inhouse mobile game studio - IronSource bought Israeli developer Upopa in 2014 - it also has the ideal situation to test out its learnings. "It helps keep us closer to the market," explains VP Mobile Sales & Operations Omri Halamish. 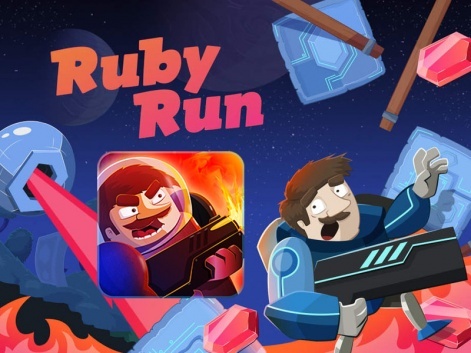 When it comes to its most recent release, physics runner Ruby Run, one thing IronLabs played around with was app store icons. "When you look at the top 50 games, a surprising number use an image where the character has an open mouth and you can see their teeth," Kaplan points out. Of course, this could be a phenomenon based on the fact that Clash of Clans and Game of War - two of the top games - have this trait. That said, it also hold for titles as varied as The Simpsons: Tapped Out and Frozen Free Fall. And certainly, IronLabs is eating its own dog food, changing its planned icon to one with an open mouth and visible teeth. At Splitmetrics.com we've been A/B testing icon for a good amount of customers and found out that it's all about emotions not the mouth itself. "And certainly, IronLabs is eating its own dog food..."
Had to Google this up because I originally thought it was some kind of misprint lol. "Eating your own dog food, also called dogfooding, is a slang term used to reference a scenario in which a company uses its own product to test and promote the product"
Sorry - maybe fell into 'tech journo talk' there.